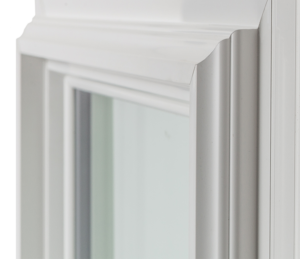 Signature Gold’s multi-chamber, high quality unplasticized vinyl (uPVC) extruded frame and sash are designed for strong, long-lasting, low maintenance and thermally efficient windows. Fusion welded frames and sashes create solid units with stronger joints and cleaner lines, and fusion welding seals the chambers, making them virtually impenetrable. Long lasting, structural silicone wet glazing permanently bonds the glass to the sash frame, adding strength and additional defense against air and water infiltration. Signature Gold windows feature a fully interlocking meeting rail with low-profile Uni-Tilt locking device that both locks and latches the sash securely to the jambs, eliminating additional visible hardware with a single latch. The system of interlocks creates a virtually impenetrable locking mechanism for strong, safe and secure windows. Heavy duty vent latches allow the window to be partially opened for controlled ventilation. Our uPVC is a more rigid vinyl with a thickness you should expect in a premium quality vinyl window. It’s highly resistant to UV light damage, is easier to clean and won’t fade, crack, peel or warp. Designed and styled to create a beautifully classic, freshly-painted millwork look, The Signature Gold window gives your home an architectural interest to stand the test of time. No window leaves the factory without the careful scrutiny and trained eyes of a skilled craftsman committed to excellence. A true sloped sill promotes drainage and eliminates internal weep holes that can clog. Most operating sashes can either be tilted in or lifted out and can be easily cleaned from the inside. 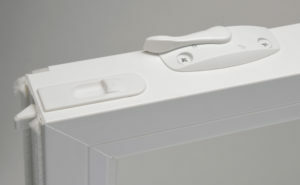 The updated Uni-Tilt lock lever provides one-touch operation of the tilt-in sash feature. 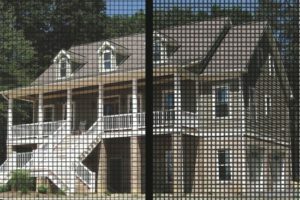 Ultra SeaClear screens are standard with Signature Gold windows, and carefully engineered to provide more light, visibility to the outside, and airflow while keeping out the bugs. See the difference … this image shows the Ultra SeaClear screen on the left, and a standard window screen on the right. These elegantly designed full-flange snap-in screens blend into the window profile and stay securely in the screen track. On casement windows, screens snap securely into place … no more ugly clips!